I love shrimp dishes. But unless you make it yourself, these dishes never come with enough shrimp in them to achieve satiety. When I heat this up in the lunch room, all my colleages suddenly look like they’re going to drop over to my office for a little lunch time meeting. I like this over brown rice. The rice isn’t included in the calorie count below. I typically use two bags of frozen shrimp, and let it thaw in the fridge before I make it. The hardest part is chopping up the tomatoes, but it’s worth it. Heat olive oil over medium heat in skillet; add garlic and cook for about 30 seconds. Add shrimp and saute on each side for 1 minute or until they are pink on the surface. 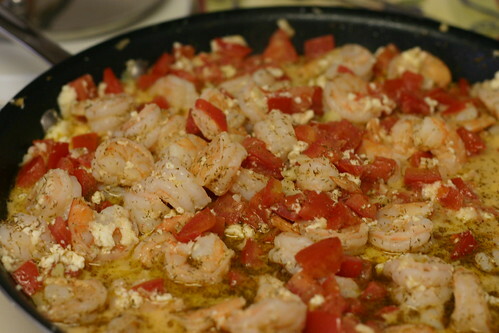 Add the tomatoes and feta to the pan and stir until sauce begins to form, about 6 minutes. Calories 246; fat 12 grams; protien 31 grams; carbs 7 grams. Adapted from a recipe by Karina Tanguay.